BANDS and trends come and go, but the Foo Fighters are here to stay. This third album defines their classic rock-n-Grohl sound with tuneful brew, also found on their last two albums. The opener Stacked Actors parks itself at the heavy metal reserved lot. Breakdown is Grohls ode to the interaction of love and an unsightly complexion. Learn To Fly reintroduces the band to those who have been backstreeting the Foo Fighters absence since the summer of 97. Adam Kasper gives immense freedom to the track as is also evident on Gimme Stitches. Aurora is the prom night/ class song with a chorus containing the phrase "hell yeah." Dave keeps Peter Frampton alive on Generator. Its fast and furious with Hawkins creating some fireworks with skins. Headwires showcases the influence of CARS on the band. Aint It The Life confirms that the fighters are okay with experimentation. 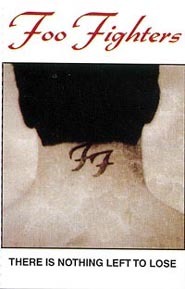 MIA and Live-In Skin are typical Foo style. Other tracks worth listening to include Breakout and Next Year. Rest assured, grab this one  there is nothing to lose. 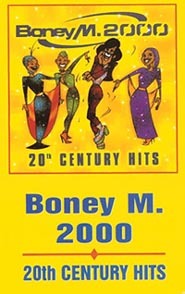 Boney M once set a new definition for lightweight and frothy dance pop. Hit after hit, Boney M treated us with timeless pop classics. This is Boney M remixed. Probably Frank Farians idea of how the band should sound in the new millennium. Liz Mitchell, Marcia Barett, Mazie Williams and Bobby Farell together formed a hit-factory galloping tracks which immediately shot onto the Top 10 music charts the world over. The magic relives through this album. Well, all the hits are here. The album opens up with the mega hit Sunny, followed by Daddy Cool, Ma Baker, Rivers Of Babylon, Gotta Go Home, Rasputtin, Painter Man, No Woman No Cry, Brown Girl In The Ring and Horray ! Horray ! Its A Holi-Holiday. The second half of the album is a more peppy version of the previous tracks, offering a fantastic medley of all their hits. Ever wondered how a cocktail of one of the loudest rock bands and a symphony orchestra would sound like? Simply brilliant. This is no Garage days revisited or a re-Garrage follow-up. 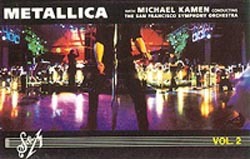 Metallica undergoes a cross-genre gene splice jamming with the San Francisco Symphony Orchestra. Recorded last April at the Berkeley Community Theatre, California, the fans were wowed by the spectacle of 70-piece orchestra swaying away smoothly behind metal curtains. It is like listening to a sweet lullaby and a howling baby together. No, just joking  the result is splendid. The orchestral arrangements are penned by ex-New York Rock & Roll Ensemble member and movie soundtrack maestro Michael Kamen (he conducts both orchestra and band). The two-cassette/CD set offers such great hits like Master of Puppets, Of Wolf And Man, The Memory Remains, For Whom The Bell Tolls, Wherever I May Roam, Sad But True and Enter Sandman. The concept gels better with ballads like The Thing That Should Not Be and Nothing Else Matters. It is surprising to find that the hit tracks like Unforgiven and Fade To Black could not fetch a place on the album. However, an impressive performance throughout. With the latest offering, saxophonist Candy returns to her first love of Funk and R&B. Although the album covers nearly all kinds of music forms, Jazz and Hip Hop are the most prominent. The result is thoroughly modern with music that steers away from the cliché soft approach that many instrumentalists offer. With the help of some of finest talents, Fred Preston and PeeWee Ellis (JBs fame), jazz trumpeteer Arturo Sandoval and recording star Jonathan Butler, Candy has widened her area of experimentation. Apart from Candys and co-producer Thomas Banks own compositions, this album includes cover versions ranging from Sonny Rollins Island Lady to Average White Bands Im The One. Candys focus is not on instrumental music alone, the album features vocal tracks as well. To bring up the best in funk and R&B on vocals Candy added Booker T III, Rashaad Coes and Roy Pennen, all new talents out of Keith Crouchs camp (BOYZ II Men, Rahsaan Patterson, Brandy). Notable tracks include 2025, Mr. Slim, Nikkis Dream and No Problem. A memorable experience. The Grammy nomination albums are always a treat for the less-informed music fans, which lists the hottest music of the year. The National Academy of Recording Arts & Sciences (the Recording Arts) once again honours the nominated artists here. The album contains several of the most widely-recognised categories, including the Record of the Year, Best New Artiste, Best Male Pop Vocal and Best Female Pop Vocal Performance. Anguilera doing Genie In A Bottle, Macy Gray with Do Something, the latest rock sensation Kid Rock with Bawitdaba, Britney Spears doing Baby One More Time and Susan Tedeschi with It Hurts So Bad. 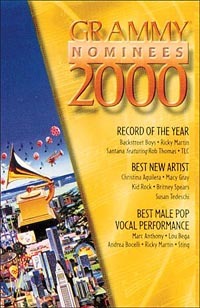 In the Best Male Pop Vocal category the nominations are Marc Anthony doing I Need To Know, Lou Bega with Membo No. 5, Andrea Bocelli with Sogno, Ricky Martin with Livin La Vida Loca and Sting doing Brand New Day. Apart from showcasing the years most happening tracks, a portion of the proceeds from the sales of 2000 Grammy Nominees album will benefit The Grammy Foundations arc of music education programmes such as Grammy In The Schools, Grammy Concert Series For Children and Grammy High School Jazz Ensembles. Thats noble music with noble cause. On Feb 23rd, the 42nd Grammy Awards ceremony was held where Santana wiped off whooping eight Grammys, a figure equalled by Michael Jackson. Out of the awards, the notable ones include Christina Anguilera for Best New Artiste, Sarah McLachlan for Best Female Pop Vocal and Sting for Best Male Pop Vocal Performance and Best Pop Album. 1.What is MeshellcNdegeocellos real name? 2. What was the name of the song R. Kelly wrote and produced for the group N-Phase? 3. Which two NSYNCers jump onto a train in the video Bye, Bye, Bye? 4. What song does Sarah McLachlan sing on the Toy Story 2 soundtrack ? 5. What movie did Meatloaf make a guest appearance in? 6. Which song of Korn was nominated for the Grammys in the best short video category? 7. Which famous production company does Melanie C (ex-Spice Girl) own? 8. Natalie Meroco sings about an ape in which song? 9. What is the main track of the 1980 Work Rest & Play Ep by Madness called? 10. What Fresh Hell Is This is released by which singer?